Select any line in your LayOut document. Make sure the Shape Style dialog box is visible. If it isn't, choose Window > Shape Style from the menu bar to open it up. 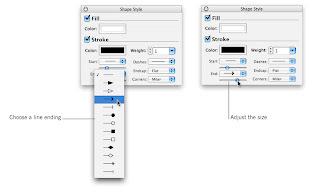 In the Stroke section of the Shape Style dialog box, use the "Start" and "End" drop-down lists to choose "endings" for the line you selected in Step 1. To turn your line into an arrow, choose an arrowhead. Adjust the slider under each drop-down list to change the size of the arrowhead (or other line-ending) you just created. If your arrow isn't pointing where you want it to, make sure it's selected, then move its arrowhead by clicking and dragging on its green "endpoint dot". Release your mouse button to drop it where you want it to point. Now here's the cool part: arrows you create in LayOut are "sticky". 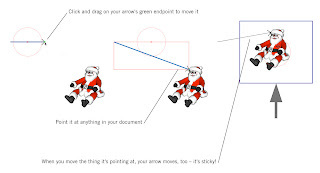 When you move the object your arrow is pointing to, your arrow moves, too. That way, you don't have to re-position all your arrows every time your layout changes. Happy pointing! I create arrows (or any line) and they DON'T STICK to anything. If you first draw a plain line and then change it to have arrow heads afterwards, LayOut will not actually make the arrows sticky until you move an endpoint with an arrow head. Doing so will 'engage' sticky mode.